Happy St. Nicholas Day! I hope you’ve all been good this year and receive only treats overnight in your shoes! Today’s guest host is longtime Virtual Advent Tour contributor, raidergirl3, who has been a part of it since the beginning. (You can see her history of contributions here.) Today she shares why December 6th is such an important date in Canadian history. It was a hectic week, which means not much knitting got accomplished. Nothing old is done. Nothing new is started. Tomorrow I vow to do one or the other. I’ve done better on the reading front. I read the first chapter of The Muse of Nightmares, which is dark (duh!) and kind of maybe don’t want to read it right now. I was able to renew it, so maybe I’ll put it aside and try again next week. 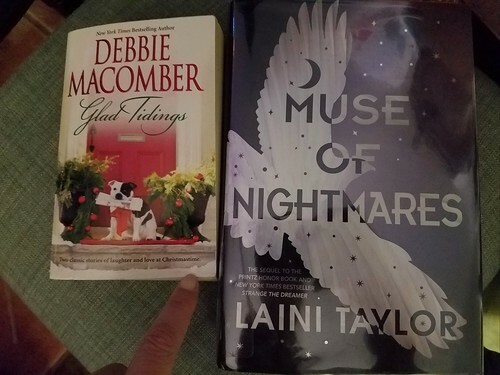 I have plenty of other paper books to choose from, including Glad Tidings, two holiday romance novellas which have been perfectly adequate bathroom reading but seem unlikely to advance beyond that. I think I’ll finish The Wolves of Willoughby Chase next, provided I can lay hands on it quickly. Otherwise, Christmas Caramel Murder, Christmas at Eagle Pond, and Ghosts of Greenglass House are the leading contenders to read next. I’m listening to Michelle Obama’s Becoming, which she reads, and I now feel like I have a wise girlfriend keeping me company while I wash the dishes at night. I also have Christmas at Little Beach Street Bakery out on audio, which is by the same author who wrote The Bookshop on the Corner, which was fine, but nothing particularly special. I’ve listened to the first few chapters, because a lot of people seem to really think it’s sweet, but I’m not sure I’m invested enough after the first few chapters to keep going. There’s probably another half hour before we learn what the driving force of this book’s plot is going to be (there’s been almost 45 minutes of set-up so far), so I suppose I’ll give it that much. Otherwise, I’ll probably just return to hanging out with Michelle.